In the summer of 1886, William Grant set out to fulfil a lifelong ambition, a vision to make the best dram in the valley. Along with his seven sons, two daughters and one stone mason, they began building his Distillery by hand, stone by stone. After a year, the first drop of spirit falls from the copper stills on Christmas Day 1887. William named the distillery Glenfiddich, Gaelic for Valley of the Deer. 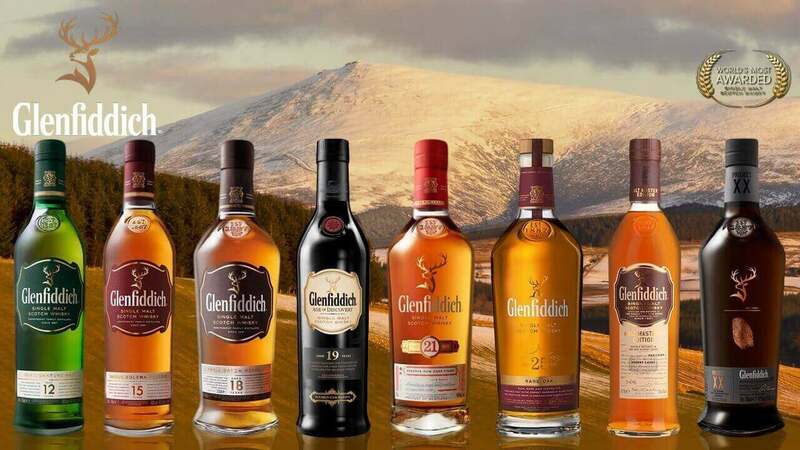 Glenfiddich is one of the few single malt distilleries to remain entirely family owned and now the World's Most Awarded Single Malt Scotch Whisky, a true reflection of William Grant’s passion, determination and pioneering spirit. The famous triangular bottle shape was designed in 1961 by influential 20th century designer Hans Schleger, in honour of the three ingredients used in single malt whisky; water, air and malted barley. In 1963 Glenfiddich goes global as Sandy Grant Gordon, great grandson of William, is the first to actively promote single malt whisky outside of Scotland. Until then a well-kept secret of the Scots, consumers who were used to drinking blended styles were now enjoying the complexity of the Scottish single malt. Rare skills, specialist knowledge and some of the oldest wisdom in the world of whisky have been passed down through the generations by the distilleries master craftsmen. It has started the same way for over 125 years. A mixture of specially sourced ground barley is added to springwater and heated to 64°C. The ‘mash’ turns to sugar, dissolving into a fine sweet, tangy liquid called wort. The wort is drained and cooled, yeast is added and fermentation begins. The mashman records the temperatures, volumes and sugar gravities on a chalkboard - a process all of his predecessors have always followed. The wash is heated and condensed in copper wash stills for its first distillation, and a second time in spirit stills. The newly distilled spirit flows in –clean, sweet and fruity, sits around 70% ABV and ready for maturation. The shape of Glenfiddich’s copper stills are identical to those first used when the distillery was founded. Since 1957, specialist craftsman are onsite tending to 28 uniquely shaped and sized copper stills (one of the very few distilleries to do so), and which contributes to a superior tasting whisky. The Head Cooper builds, mends and chars the casks with centuries-old knowledge and tools. The team of highly experienced coopers tend to around 126 casks every day at their onsite cooperage, one of very few remaining globally. It’s a great responsibility to work with oak that will give as much as 65% of the whisky its flavour as it matures. Warehouses stacked with casks of gently maturing single malt Scotch whisky are watched over by experienced warehousemen. They check casks for leaks, take samples to the Malt Master and keep a watchful eye over the marrying process. Ever watchful, they keep the Malt Master up to date with the precious, ageing malts. Skill, drive and dedication underlie a Malt Master’s ability to nose, taste and develop exceptional whiskies. Generations ago, Glenfiddich’s Malt Masters introduced marrying to smooth out fluctuations in flavour naturally occurring in maturing whiskies. Once whiskies have reached maturity, they are combined in oak marrying tuns. Here, spirits from different casks mellow and gather great consistency and harmony until the Malt Master decides they are ready for bottling. This knowledge has been passed down by Malt Masters so the drinker can enjoy over 125 years of wisdom in every glass.